Hey guys! 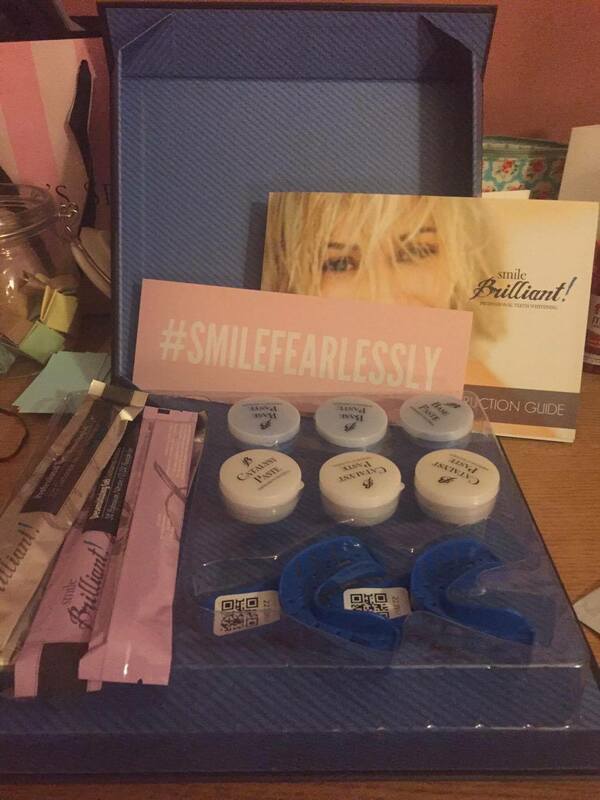 I was so happy when I was contacted by Smile Brilliant to try and review their at-home teeth whitening kit. My teeth weren't necessarily very yellow, but they were missing that white sparkle they once had. 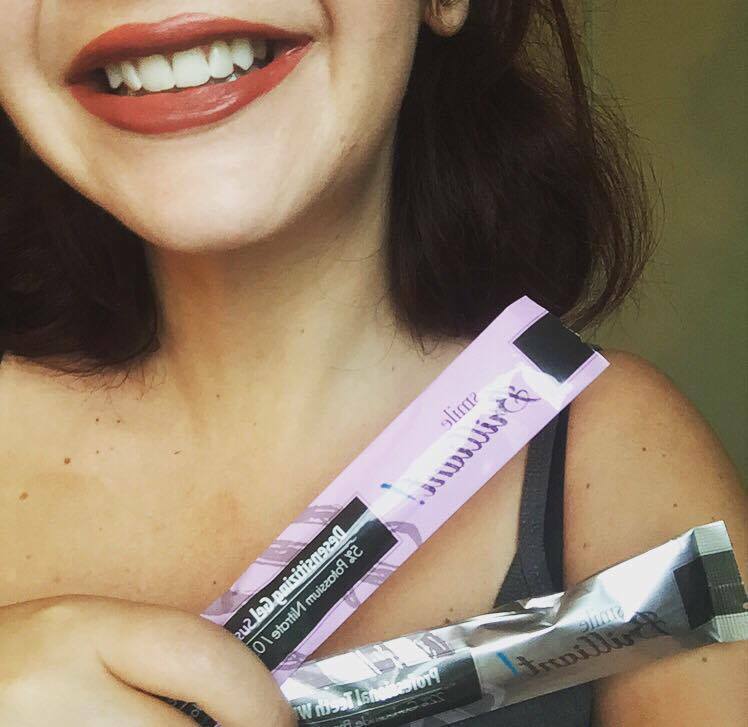 I'd tried a teeth whitening kit once before but the experience wasn't great (more on that later), so I was excited to see the results I'd have with Smile Brilliant. Keep reading to find out more about the product and my thoughts on it. Smile Brilliant is a national dental lab in the United States designed to help customers achieve professional strength teeth whitening at home, without having to visit a dental clinic. They even create your custom retainers for you. The pack I received came with 3 teeth whitening gel syringes and 3 desensitising gels, as well as a kit to mould your teeth for the whitening trays, a pamphlet all about the product and an instruction manual. The gel contains 22% Carbamide Peroxide, which is the same amount that is offered at dental clinics - for triple the price ($500 to be precise). 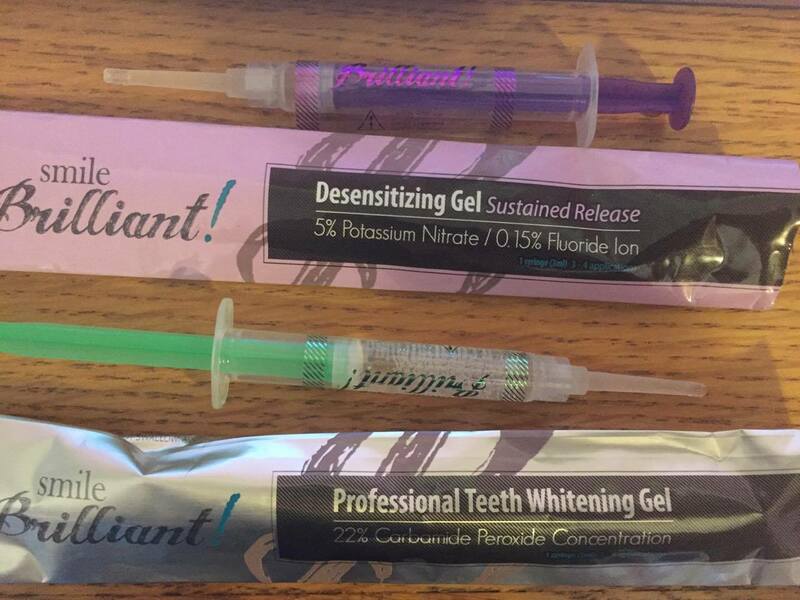 The desensitising gel is also designed to replenish the nutrients lost in your teeth during the whitening process. STEP 1: The first step is to make your dental impressions and then send them off in their trays in the packaging that is provided in the kit - all the instructions come in the pack and you're given extra putty incase you make a mistake! If you're in the US this is free postage, if you're international you'll have to send a small fee to post it. Unfortunately for me, I seem to have weirdly shaped teeth in that that my mouth is quite small and my teeth curve more at the back, so my top teeth didn't fit well in the tray. Michael was very quick to send me a larger tray but sadly this didn't fix the issue either - luckily I had some retainers lying around that I'm supposed to be wearing after having taken my braces off (4 years ago). STEP 2: Once you send off your impressions, you'll receive your custom teeth whitening trays typically in a week. Then you're ready to embark on your teeth whitening journey! All instructions will be in your pack, but to sum up the process you should apply a thin strip of gel to the front middle part of the retainer (so you cover the whole tooth). There's no need to do the back, as well no one is going to see them but the inside of your mouth. Insert the retainers and leave for 1-3 hours, depending how patient you are and how long you can go without snacking! That's why I recommend doing this in the evening or right before bed and set and alarm if you think you'll have the energy to wake up and take them out. Oh and make sure you floss and brush your teeth BEFORE putting the trays in, if not that would be nasty. STEP 3: I highly recommend purchasing the desensitising gel if your teeth are sensitive, and even if they're not they'll prevent them becoming sensitive and replenish all the nutrients in your teeth. You follow the same procedure as you did with the whitening gel, but you only need to leave this on for 15 minutes tops. STEP 4: Avoid eating food or drink for the next 15-30 minutes and don't rinse/brush your teeth after - as your saliva will help with the process. Then just stare in the mirror and smile at yourself for like 10 minutes whilst you take in those pearly whites (optional). 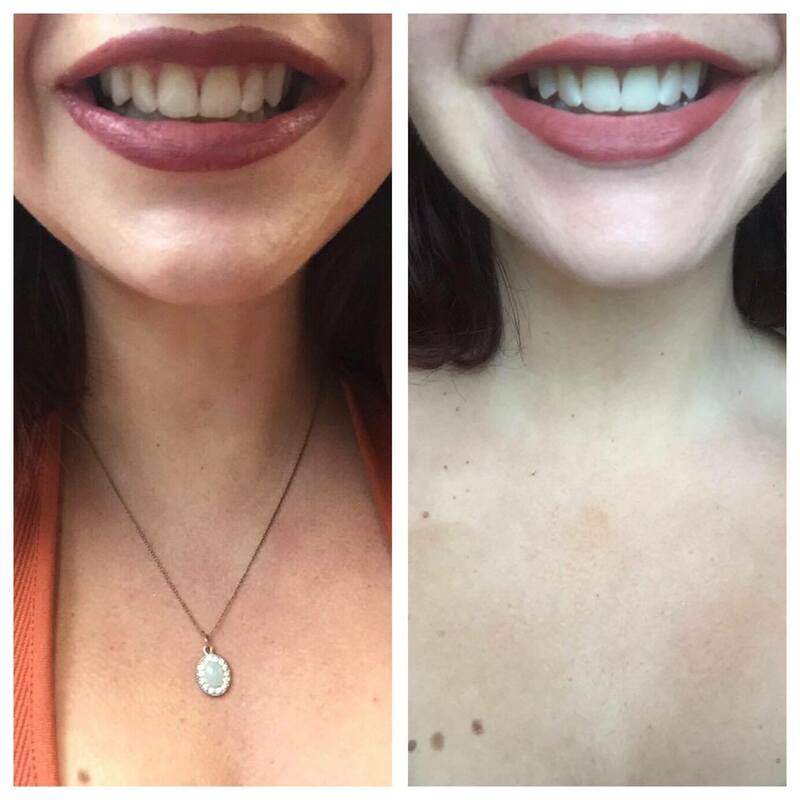 From day 1 I could already see a difference in the colour of my teeth, which is definitely not something you get from whitening strips or whitening toothpaste. The product is designed to bring out your natural tooth colour, and not have you looking like you've applied tippex or white paint to your teeth. It's completely pain free, which is something I experienced with the previous teeth whitening gel I tried when I was 18 - probably due to the fact I bought it off eBay. That gel burned and I couldn't keep them in for longer than 10 minutes, with Smile Brilliant the only discomfort is the realisation that my teeth have moved since I removed my braces so I feel like one of my molars is trying to shift itself back into it's original place. Below you can see my before and after results after using the product for a week for an hour and a half each day. Finally the part you probably all came here for. Smile Brilliant have kindly teamed up with me to give one of YOU guys a chance to win a a full teeth whitening kit worth $120 - that's £85 for you British folk. All you have to do is head to http://www.smilebrilliant.com/contest#teawithgi and fill in your first name and email address - the giveaway will close in two weeks so get moving! The winner will receive $139.95 store credit which is equal to our Teeth Whitening Trays + 3 whitening gel syringes and 3 desensitizing gel syringes or the Teeth Whitening Trays + 6 whitening gel syringes. I did everything for my teeth, I am facing little bit teeth yellow problem. As your experience for smile brilliant, I am sure I will get positive result for my teeth. Find the cosmetic dentistry service like teeth whitening New Malden for beautiful and bright smile. Great product you have shared it is best product for teeth whitening I have used it since 1 year, It is in reasonable cost. Buy the best and most recommended teeth whitening kit at best price. Such a best product for our teeth whitenign and keep it strong and germs free, I have already used it nad I got better result. Buy Teeth Whitening Strips Online on Crestwhitestrips for teeth white.